Leave a review for EVR Cabinet! Thanks to modern technology, you can get a lot of power into a compact device. That is definitely true for our EVR cabinet model. This unit offers all the same high-performance electronics and softening resin you can trust, all in one, streamlined appliance. To learn more about our EVR series or about our compact EVR cabinet model, contact your local dealer today! Hard water and mineral buildup can wreak havoc on your home, diminishing the efficiency of your appliances and providing low-quality, unreliable water. Installing a water softener can help improve your home's performance and prolong the life of your appliances, but limited space can often be an issue. Not anymore, not with the EVR cabinet unit! The cabinet model can fit perfectly under stairs, in water closets, and in other tight spaces, offering all the efficiency, minus the space. 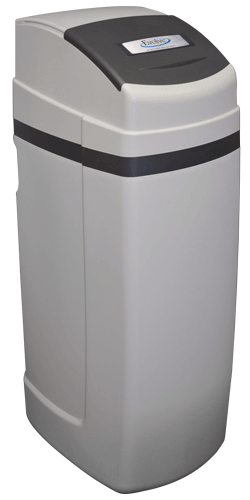 This system uses a high-capacity resin to effectively reduce water hardness and with a Patented Chlorine Generator, its automatic cleaning cycles can offer even more peace of mind. Give your family the water they deserve with a unit that is highly efficient, innovative, and stress-free. 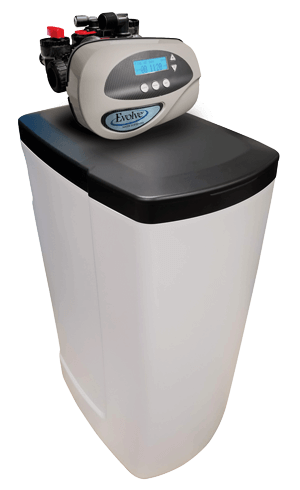 Give your family pure water with the EVR cabinet unit! Offering low-maintenance, automatic cleaning cycles. Providing maximum efficiency, which helps you save money on salt and water. Wirelessly sends you stats and notifications about your system.